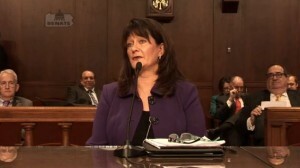 An AudaExplore representative testified Wednesday in favor of a bill allowing photo-only appraisals in Pennsylvania, touting an app to do so which omits any collision repair shops not selected by an insurer. Ironically, House Bill 1638 had partly been promoted by sponsor Rep. Mike Tobash, R-Dauphin County/Schuylkill County, a Nationwide agency owner, as a means of combating steering. A customer could just submit photos and go wherever they wanted, he argued. Vehicle owners want the capability to launch a claim online with photos, AudaExplore government affairs Director Diane Klund told the Pennsylvania Senate Banking and Insurance Committee on Wednesday. “We’re responding to that demand from consumers and insurance companies,” Klund told the committee considering H.B. 1638, which passed the House in December. She plugged AudaExplore’s 2015 GoTime Driver app, which allows customers to submit a claim and photos related to it as well as schedule a repair. The app, demonstrated in a promo video aired at the committee hearing Wednesday, allows customers to indicate damage on a 3-D representation, scan a VIN number to uncover hidden options and take a photo assisted by a vehicle outline frame and the smartphone’s own high-quality camera. “In most cases, this is not a matter of submitting a blurry photo,” Klund said. If an insurer has the capability, the customer can even video-chat with a claims representation during the photographing process, she said. “It’s more than just submitting photos,” she said. The VIN scanner and GPS determining the user’s location (to ensure one isn’t just photographing a junkyard) helps minimize fraud, she said. But seemingly minor damage — or no blemishes at all — can be misleading, as testimony Wednesday as well as these Honda, Land Rover and Chevrolet cases indicate. In many instances, the debate is moot, as the existence of a lienholder means the customer can’t just take the money and fail to bring the car in for repairs where greater damage can be uncovered, according to Klund. “It’s their collateral,” she said. Plus, the app can ask the user if the airbags have blown or fluids are leaking, she said, providing another check and balance and directing them to a shop if the answer is in the affirmative. Still, for something designed to give customers greater flexibility, it carries the potential to limit their choice, both by allowing the superficial damage to suggest a low settlement amount and by potentially misleading them as to which shops are available to serve them. Asked by Rep. Thomas McGarrigle, R-Springfield Township, Klund said that the app only contains details for shops an insurer picked, not all options available. “The insurance companies decide what body shops go on the app,” she said. This seems to put AudaExplore, which Klund said serves about 500 Pennsylvania repairer clients, directly in the position of costing some of its customers business for the benefit of other customers. “If I (a hypothetical user) didn’t understand it: ‘Well, oh, these are the only four choices I have,'” argued McGarrigle, who owns McGarrigle’s Automotive Services, a mechanical shop. But should a state mandate one, “There’s an antisteering message that comes up,” Klund said. An insurer could also add every shop in the state, she said. “But the insurance company decides,” she added.